Automatic watches are self-winding. The have some form of a weight that swings and in doing so wind the watch. Some automatics are called "bumpers" as the weight swings from side to side and bangs into springs at each end. Others have rotors that will spin round and round, in either direction. Unlike mechanical movements that are wound by hand, automatics cannot be over wound. They utilize a clutch to slip when the mainspring tension is fully loaded. Automatics can be wound by hand using the stem or they can wind themselves while being worn. 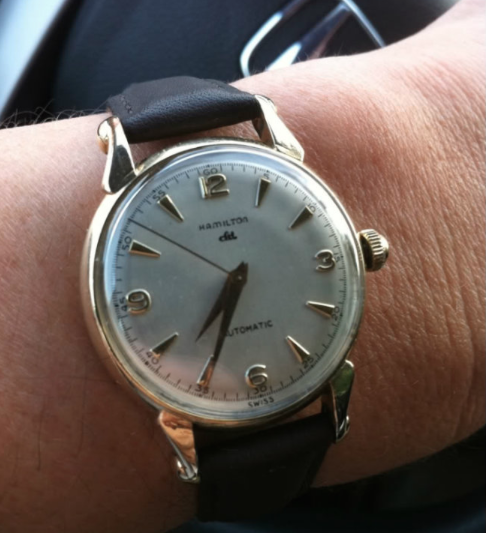 Hamiltons first Automatics appeared in 1954. These early automatics all utilized imported Swiss movements. Hamilton numbered their models where the first digit indicated the case material. So a K-1XX was 18K, K-2XX was 14K, K-3XX was 10K, K-4XX was gold filled and a K-5XX would be stainless steel. One example of the earliest Hamilton automatics was the K-400 CLD. This watch was part of the CLD (sealed) family with a series of gaskets intended to make them weatherproof. 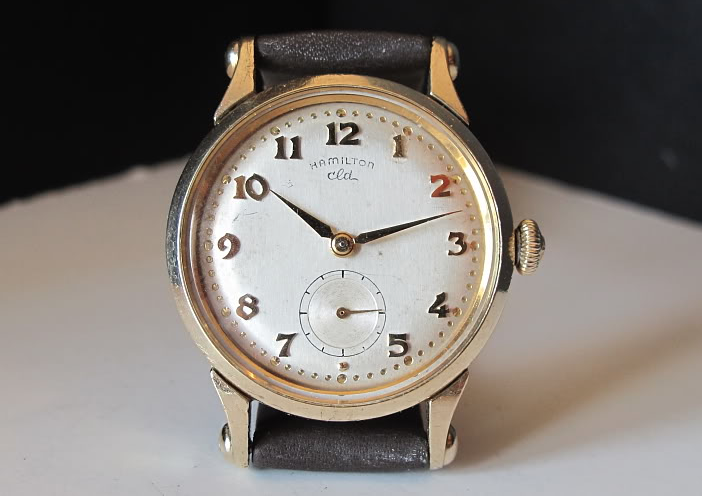 It's a good sized watch and the case looks very similar to the Hamilton Haddon CLD introduced the year before. 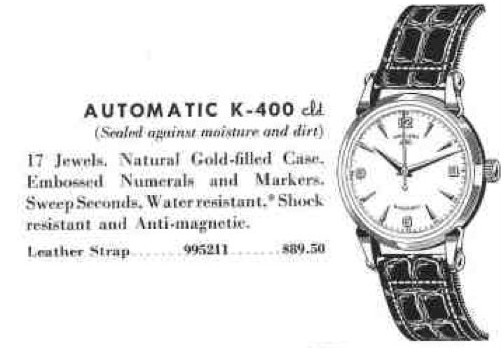 The K-400 uses a 17 jewel Swiss movement (I don't recall the grade). Mine had some dial scuffs and I got it refinished but the it came back with incorrect fonts - something that can often occur if the exact dial plates are not available. 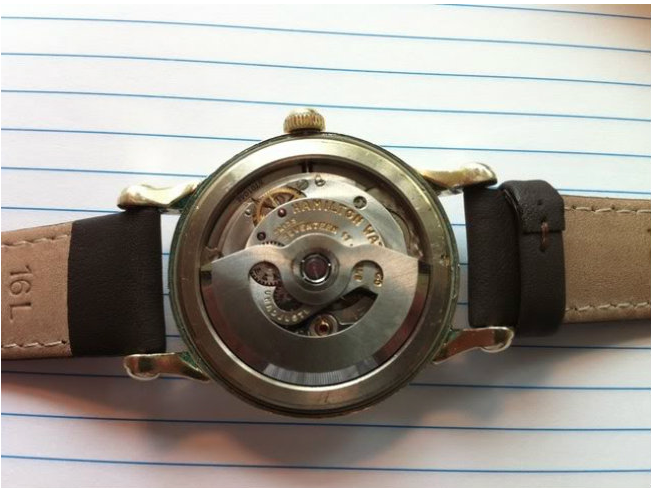 Here's a movement shot that shows the rotor of the movement. This early design used ball bearings to minimize the friction of the rotor. 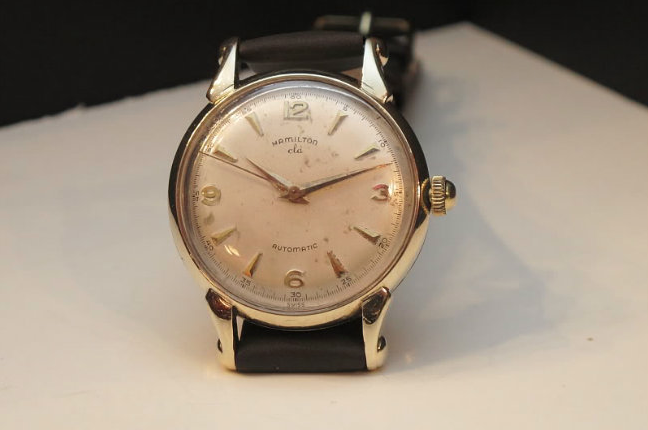 And just for reference, here's a snapshot of a Hamilton Haddon from the same time period. Although the dials and movements are different, note the similarity of the case design. What is a good price for a 1954 K-400 in near mint condition? Thanks much, it's a beautiful piece! That's a good question. I would imagine $150-$250 would be a fair price, depending on if it's recently serviced, etc. I have a hard time valuing watches though, to be honest. I think I tend to be on the low side. You could list it on eBay with a very high reserve (so it doesn't sell if you don't want to sell it) and then see how high the price gets with bidding... in an efficient market that's what the market will bear. But you need two interested bidders and sometimes that doesn't work out. I picked up a K400 on eBay for about $25. It was marked as non-working and the crystal was scratched and dirty. The main problem was getting the movement to mount properly. The movement was loose inside the case and the second hand would rub against the crystal and stop. Once that was fixed the watch came back to life. While this isn't an American made Hamilton, the size bits my wrist better than the earlier CLD's. Love this site BTW, I can't believe how much information and pictures you post. Great resource for finding vintage Hamiltons. Hi Dan - I have been offered a K400. However, while your picture of the dial shows a numeral at every fifth minute mark (i.e. 5, 10, 15...thru 60), the one offered to me does not. Further, your dial shows the word "Swiss" just below "6". Would these be indications of an incomplete redial? I'd love to have one of only three automatics in the CLD line. I'm not really a purist (btw - I kept the black redialed Lester...it just looked too good). I just want to know what things really are. I guess I'm just curious if little missing details like that mean redial or were dials simply varied coming out of the factory? It's probably a slightly incorrect redial. It would certainly have said SWISS at the bottom and if it's missing it's surely a redial. Thanks. Your blog is invaluable. The pics, descriptions and general commentary are great references. I have a reference guide but your blog brings the reference guide to life. Using the two together, I've been able to properly identify at least a half dozen errors in watch descriptions. Some discrepancies I've decided to accept. Some not. The real issue is simply to know so as to make informed decisions. And for that I thank you.